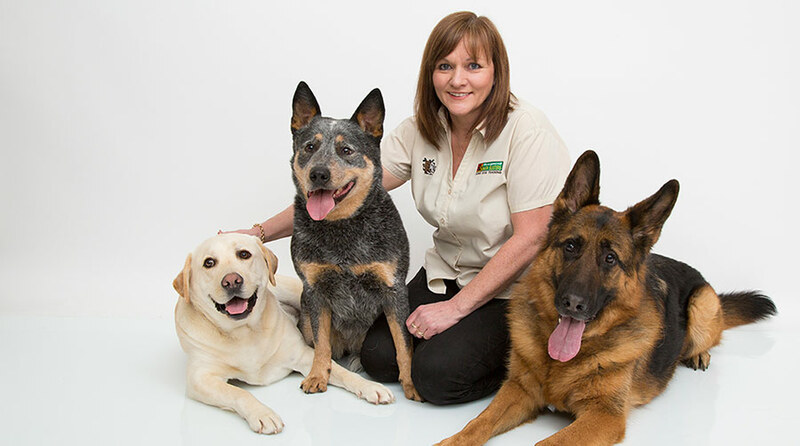 I have been working as a dog trainer and behaviour therapist for many years your area. 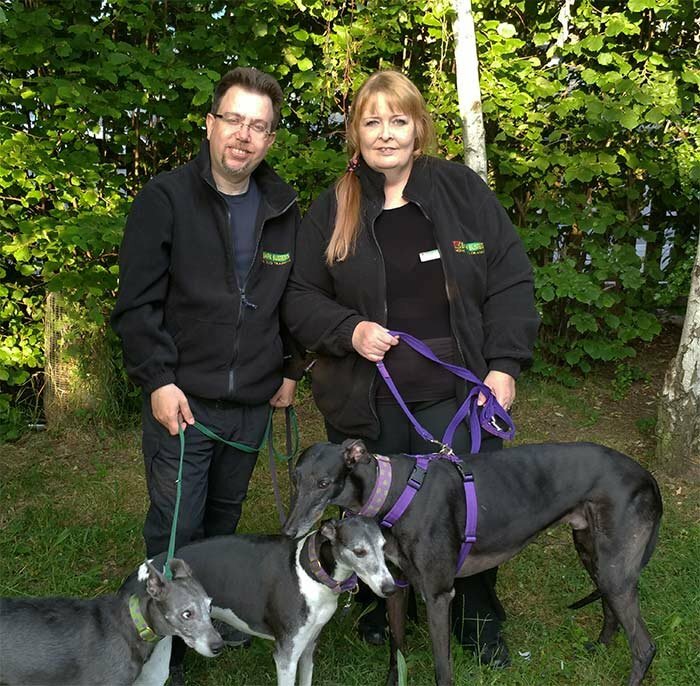 Graham has many years of dog handling experience assisting me with reactive dogs and has recently joined Bark Busters as a qualified trainer in his own right. We are proud to say that this year is the fourth time Graham and I will running a fun dog show at the All About Dogs Show at Garon Park in Southend where we raise money for local dog charities. Either myself or Graham will visit your home and assess the situation by talking to you and observing what is going on. We will discuss what we think is happening and agree a plan with you. We will not be judgemental or critical of you or your dog’s behaviour at any time. We will then work together to put this plan into action and you will carry on with the plan, with whichever of us is your trainer supporting and guiding you as necessary. This includes follow up visits with phone and email support for a whole year after your first visit. There was Bobby, a cute 9 year old scruffy mongrel who had was attacked in the park and then started to attack any other dogs he met. His owners just couldn’t cope and so had stopped taking him for walks. Zak, a huge German Shepherd who pulled so hard he walked on his back legs. He had terrible separation anxiety and his previous owner shut him under the stairs to stop him destroying their house. I lost a sofa, two doors and a coffee table before he settled down. Russ was a very elderly mongrel, who was given to me by my Vet. He had a benign brain tumour and we had to hand feed him and encourage him to drink water every day. Jason was a miniature poodle whose owner died and nobody in his family liked him. He also had separation anxiety and barked and whined constantly when I went out. He also would sit on my lap and growl at everyone and anyone who came near. He was 10 years old and I was told I couldn’t help him, but that was not true. He ended his life happy and loved by my whole family. I did have one puppy and chose a Yorkshire Terrier; Billy was had a lovely personality and no actual behavioural problems, but instead he developed a serious medical condition at three which meant he couldn't deal with any stress and would toilet in the house. This personal experience means that I am always careful to look at possible medical reasons for problem behaviour. At the moment my husband and I have the pleasure of owing 3 dogs. When we met I had a Whippet/Terrier cross girl who I named Lottie. She was a working rat and rabbit dog until she had a serious accident when she was 7 and was then too slow to do her job. She didn’t realise that she had slowed down so would chase squirrels and cats with absolute determination. Nothing would stop her when she was in “prey” mode and it was hard work to train her to come back on command. She came to me with a jumping problem and would growl and nip people if they tried to stop her stealing food, but when I got her I found she had other problems. She would She didn’t like dogs and would sometimes charge at dogs to drive them away. If they barked at her she would bark and bark and keep barking until they were a spot in the distance. I have got all of this sorted but she is now going deaf so we have sleigh bells on her collar so we know exactly where she is going off lead. She is also losing her sight so we have to keep her on lead at night because she gets disorientated and runs at speed in the wrong direction. I became a Bark Busters Trainer because of personal experience. My sister’s dog was a lovely, friendly and obedient dog, but from the time my nephew started to crawl he would occasionally growl at him. One day he came too close to my nephew who was then 15 months old. He grabbed his face and Ouzo nipped him. At that moment our world turned upside down. Everybody told my sister and brother-in-law to re-home him or put him to sleep as once a dog has bitten he will bite again and couldn’t be trusted. Fortunately they recognised that they needed help and called in Bark Busters. The Bark Busters Therapist came to see us all and we were given a simple training programme to follow. From the first lesson he was a changed dog. The fretful, growling dog around my nephew was gone. At the time my sister gave feedback saying "immediate and remarkable results...truly fantastic". For me, it proved to be a life changing moment. This is what I wanted to do! I realised that people did not have tolerate their dogs issues or try to resolve it themselves. Even if it was a truly difficult problem, a dog could be helped by its caring owners following proven and practical training methods. Hello, my name is Graham and I was introduced to the world of dog behaviour training by my wife Jo. Prior to this introduction, I had considered myself to be pretty good with dogs because most of the dogs that I encountered were ‘pretty good’! In a nutshell, that’s the problem – many of the dogs that we encounter in day to day life are fairly accommodating and just fit into our life. This is what we expect. So when we encounter a dog with behaviour problems there’s a tendency to get confused and then frustrated with the dog. “Why won’t it just do as it’s told?” “Is it my fault?” Have you ever asked yourself these questions? I have! We can also just “manage” problems rather than tackle them. My Whippet, Smudge, suffered terribly from separation anxiety and I made very elaborate arrangements so he was never left on his own because he would howl and pee in the house when he had to be left behind. I then met my wife and found that finally there was a way to truly help him. I then had to come to terms with my wife’s little dog Lottie (or “Lottiekins” when I think no one can hear me). She’s is a very high energy dog and a past master at wrapping owners around her cute little paws but with a bit of training (for me) I quickly learned how to handle her with confidence and now have a lovely and loving little dog. The latest addition to our pack is a Greyhound called Angus. Most Greyhounds are laid back couch potatoes but Angus wouldn’t come when called, ran up and down the garden barking loudly and was aggressive with larger dogs. He would wander around whining and got very growly when anyone went near him when he was sleeping. He had been stuck in a rescue for nearly six months as nobody wanted him so my wife persuaded me that he would be the perfect for us and a year on we have a beautiful dog who is a joy to live with. He is not perfect as big dogs still un-nerve him (which seems strange as he is a very big dog himself), but he looks to us now for guidance and to protect him rather than going into “attack first and ask questions later” mode.